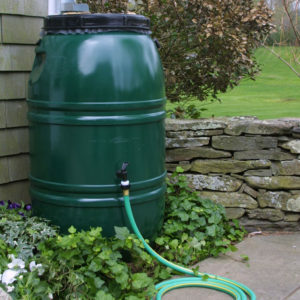 Did you know that using rain barrels actually help to conserve energy? They help the environment at the same time? They also help to reduce consumer’s water bills. Important for those of us that have to pay for our water. Some consumers still do not have to pay for water. However in many major cities there is a water meter that measures the water that we use. Consumers are billed accordingly. This is a great way to save money. It is also a great way to help the environment. Any water you collect and use on your lawn saves you money and helps the environment as well. The rain barrel shown in the picture sits under the down spout from your home. It has an overflow pipe along with a spigot with a tap that can have a garden water hose attached to it to drain water away or to spread on the lawn. This particular one is green in color. However rain barrels can be purchased in a variety of colors to mesh with the décor of your home and the surrounding gardens. The most direct saving is the reduction in the cost of the water that you use. Part of the cost of this water is the piping to deliver the water and the sewers to take away the waste water. Along with those things is the energy used to pump the water out of the ground and into reservoirs were it is treated. It is then pumped into water tanks for delivery to your home. Any time you reduce you water consumption; you will be reducing energy use and reducing your water bill at the same time. The primary benefit and the most direct benefit to using a water barrel is the reduction in cost for the water that you use. If you are billed for water they way the writer is, there are additional savings as well. There is the actual water charge which is the water that you used and recorded by your meter. In our case they then add a sewer surcharge of 117% of the water charge. This is an unbelievable amount, but that is what it is for the city that we live in. In addition they add another charge of ninety cents a day for fire supply, whatever that is. We think that it is an additional tax on our properties for the fire service. But they place it on our water bill instead of our property tax bill. Water you use on your lawn will also generate a sewer charge even though the water does not go down the sewer. If you bill for water is $100, then the sewer bills is going to be $117 for a total of $217 plus the cost of the fire service. If by using a rain barrel, you can reduce your water usage by 20% by using the water in the rain barrel to water the lawn instead of the water system. That’s $42 savings which goes a long way to paying for the cost of the rain barrel. Every reader will have to do their own evaluation to assess how much water they can save and what impact that will have on their water bill. At some point the water savings will pay for the rain barrel and you will be making a contribution to reducing energy. This is a something we can all do and make a contribution to our pocket books at the same time. We can save a lot of money over a year and over several years. Frankly I would rather have it in my pocket and not that of the city water supply company. This is another great way to save money and make a contribution to developing green energy savings solutions. Don’t forget to remove the down pipe in the fall from the barrel to avoid ice forming in the barrel and cracking it! Many people forget to do this and their water conservation project is finished until they replace the water barrel! This is just one more task to add to your list of things to do in the fall when you are getting your home ready for the winter.